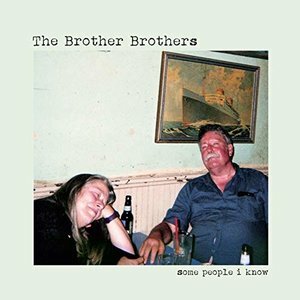 Some People I Know showcases the talents and potential of folk pop duo the Brother Brothers to become more than just another band of brothers. Back in 1961, the Smothers Brothers released their debut album commonly referred to as Live at the Purple Onion to much acclaim. The humorous duo were also talented musicians who could sing and play their folk-pop music clean and tight or fast and loose, depending on the track. One of the best cuts on the record was the medley of "I Wish I Wuz in Peoria / They Call the Wind Maria" that combined both modes of silly and serious. The identical twins the Brother Brothers hail from Peoria, but the winds have blown them to Brooklyn via the University of Illinois in Urbana-Champaign. These siblings, Adam and Dave Moss, have often been compared to other brothers acts from the 1960s, such as the Everlys, because of their familial harmonies. But the Moss' voices are not as ethereal as Phil and Don's. The Everlys came out of a country tradition rooted in the church, and their vocals soared into the higher registers. Their Brother Brothers sound shares more in common with the Smothers, who came out of a folk tradition. Not only do the songs on their debut full-length disc Some People I Know have a working-class sensibility, the two men don't blend their voices as much as they sing at the same time while maintaining their individual timbres. That said, the Brothers don't try to be funny. Even on the more lighthearted material, such as "Banjo Song" and "Sam Bridges", there's an earnestness about the concerns. There may be puns. The latter tune begins with the line "Sam Bridges burned down to El Paso" and contains quips like "the boy could tell a dirty joke like a Catholic cabaret", but there are no laughs. Perhaps this is because Adam plays the fiddle and David plays the cello and acoustic guitar, instruments known for their ability to express emotionalism. That is reflected not only in the way they play but also in the way they narrate their songs. The Brothers often sing with a lonesome ache, like the dog who has strayed too far from home in "Mary Ann". They empathize with life's losers and loners; those who have been loved and left behind. For example, they turn Peter Rowen's ode to a Chinese immigrant couple separated at "Angel Island" into a soft sweet hymn to eternal romance. The plucking of strings behind the voices suggests the Eastern motif while the English words convey the heartbreak. The Brothers original songs show the influence of bluegrass ("In the Nighttime"), klezmer ("Ocean's Daughter), and other folk styles. The two seem to purposely invoke those other Brooklyn boys, Simon and Garfunkel, on the poetic "Red and Gold" that evokes "American Tune" and "Frankie" that addresses the gentrification of New York City's most populous borough. The comparisons made between the Brother Brothers suggest that they have not yet found their own distinctive sound. While that may be true at the moment, Some People I Know showcases their talents and potential to become more than just another band of brothers.